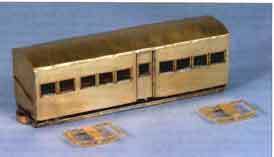 Worsley Works have increased their selection of 'scratch aid' etched brass body kits with a number of coaches for the Darjeeling Himalayan Railway. All use a 24'3 underframe, and so far there are four types available: a Second in late 1960s form with low windows and centre door, e.g. No.69 (illustrated); a Second as rebuilt in the 1980s with high windows, e.g. No.71; a luggage/guard's van in late 1960s form, e g. No.154, and a Second/luggage/guard's van as rebuild in 1988, e.g. No.500, formerly 153 or 157. Three further designs are already in progress: a 1960s Second/Ladies with low windows and doors either end, e.g. No.99; a 1940s First, e.g. No.6; and the inspection saloon Everest, No 14, also in 1940s form. All parts are very cleanly etched, with fine detail. Tabs to the fret are minimal and easily cleaned up. The holes for the door handles and handrails should need little or no opening out. The inset doors are cleverly arranged, and doors with kick guards extended down over the solebars are available as an option - these do seem to have been common. The underframe is ingeniously designed to fold up representing the support brackets, which carry the floor, clear of the solebars. Together with the riveted solebars and the curved buffer/coupler blocks at either end, the effect is excellent. As usual, the sides and ends have no form of location, but can be accurately soldered together if care is taken, standing them on a true flat surface It is worth strengthening the corners with a fillet of solder. The window frames are etched separately to enable them to be represented open if required, but note that they open upwards. Although not mentioned in the instructions, a roof is provided, with ribs etched in place. Forming the main arc is easy enough, but bending the sharp radius at the eaves may be awkward without the right tools. The brake lever is included (in fact there are two on the fret) but the small brake platform will have to be added from scrap brass - perhaps the edge of a fret. The instructions do not state which end should have the brake: for No.69, it is the five-window end. These are the most complete kits from Worsley Works for some time, and as such are to be welcomed. They still presume the builder will have drawings and photos to complete the detailing as appropriate. We plan to present soon an article by David Churchill of the DHR Society, who has been instrumental in the production of these kits, elaborating on their construction and detailing.